Mike, 5 cats and 3 Arabian horses. I’m a native Texan, born in Fort Worth. My Mother’s family came to Texas in 1823 before it was a republic. My granddaddy and my great uncles were all cowboys on the 6666 Ranch in King County, Texas. 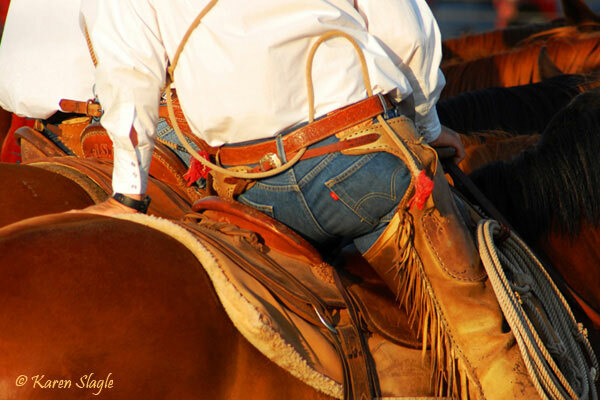 I reckon at least some of my passion for horses came through my family and our frontier roots. I use a Nikon D70, D200 and D300. I also have a plethora of Nikon lenses of all kinds from 18mm to 80-400mm. 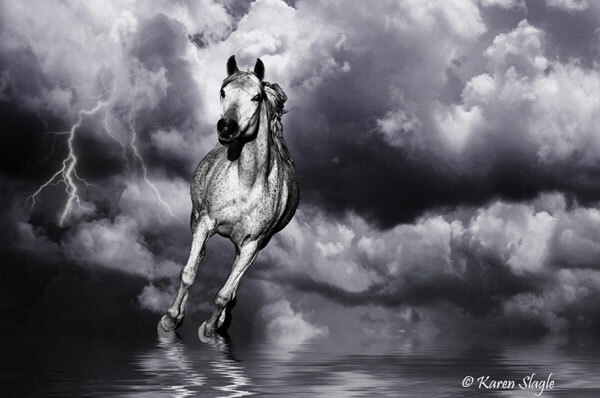 As far as equine photography my two main influences are Tony Stromberg at and Wojtok Kwiatkowski. The artist that inspires me the most is Doug West. His style of painting speaks to my heart as he paints the American Southwest with it’s stunning vistas and huge skies with billowing clouds. Why do you photograph horses? My passion for horses just goes hand in hand with photography as I love to capture them at rest and at play. Also I love the small details such as their eyes, ears and manes and tails flying in the wind. What is your favorite breed to photograph? 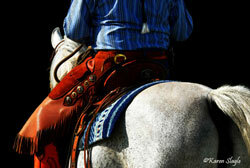 I have always loved Arabians with their beautiful carved profiles, flying tails and their spirit. To me, they are the prettiest. But I love all horses and photograph all breeds. Who are your animal muses? 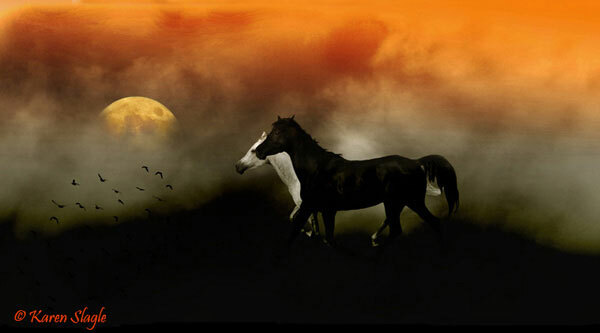 All horses are my muses as I have watched, admired and observed them my whole life. 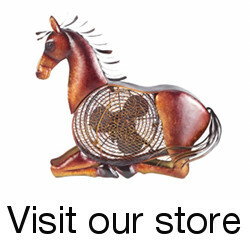 One of my first words was “horse” and they seem to call to me. My closest muses are my 3 Arabians that live with us at our country home. The internet is a great place to post our art and hope others will come and look, and hopefully to buy. It’s also a place that makes it easier to have our work stolen. All in all it’s good but we do need to be careful. It’s made it readily available for people in other areas of the country to look at my art. I also love looking at other’s art and the internet makes it easy without driving all over the country. This is a hard question as I love all my images. One of my favorites is “Falling Star”, because it has a Doug West feel, the large star filled sky and a falling star over the mesa. It also has the bluffs and mesas of the southwest with it’s earth tone colors. 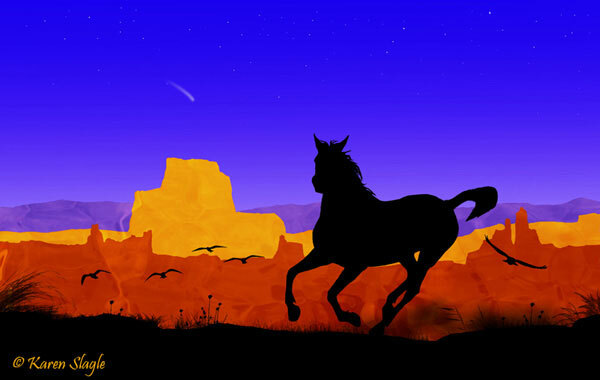 Also it contains a silhouette of my trail riding buddy, LSA Blue Moon, my black Arabian mare. I LOVE cats. We have 5 house cats that run the place. Nothing is too good for the “kids”. 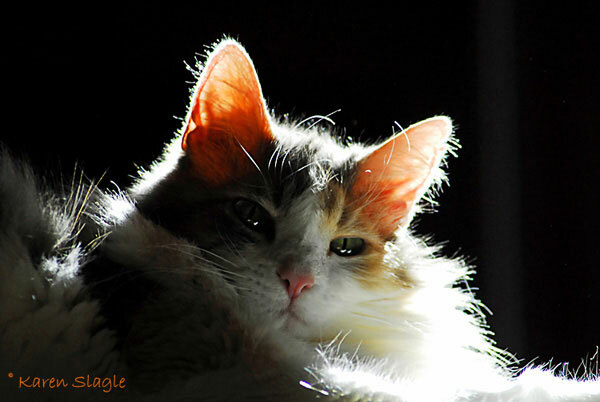 Attached is one of my favorite image of Tabby with the sun shining through her hair while she laid in front of the door. I snapped the shutter as she raised her head to see what I was doing. She holds a very special place in our hearts. Thanks to Karen for answering the interview and sharing her art. Be sure to check out her photography website periodically for updates about her latest works. This entry was posted in Interviews on May 27, 2009 by The Equinest. Thank you Paige, this looks wonderful. I truly appreciate you. My pleasure Karen, I enjoy your photography and it’s fun to be able to share it. 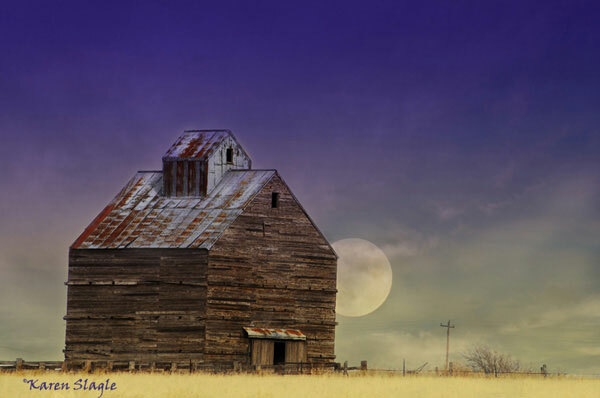 I loved seeing Karen Slagle’s work and reading some background on her and her photography. These are amazing pictures!! Very interesting interview. Karen is a talented photographer. I sent the site on to my daughter who also is an equine photographer and loves arabs. Hi Karen -so wonderful to see you & your beautiful photographs here! Karen is a gifted photographer and artist. 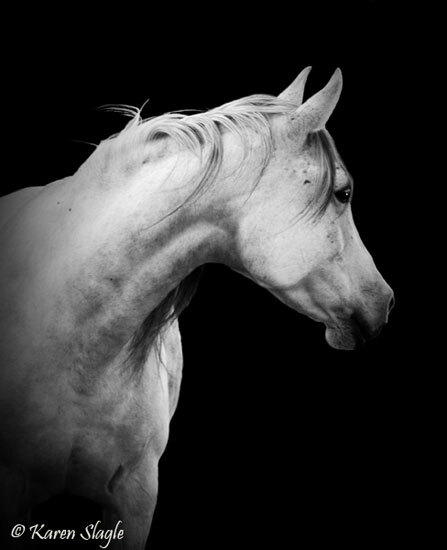 Her wonderful works capture the spirit and beauty of the horse. Congratulations on this nice piece! Thanks so much everyone for all the kind comments about my art. We were wondering if you were available to photograph some horses and manage some classified ads on the internet. How much would you charge for this service?